Please note, that if you chose your estimated time arrival and you will not come within one hour, your reservation will be automatically canceled. The management has right to refuse to register the Guest without giving the reason for the refusal. Full payment is required upon arrival in cash. Now, you need to pay price for the first night of your stay. Please check your email within 24 hours after the booking. If within 24 hours after making the booking you did not receive the invoice or the invoice remained unpaid, the reservation will be automatically canceled without any penalties. Chargeable early check-in / late check-out. NB! Automatic no-show cancellation is after 9 p.m. if you arrive after 9 p.m.
Failure to arrive at the hostel will be treated as a No-Show and no refund will be given. Smoking is allowed only in special areas. Breakfast NOT included, but available at additional cost. Parking request on arrival. Refundable deposit for parking card 200 aed. Payment upon arrival in cash. Chargeable early check-in / late checkout. Full payment is required upon arrival in cash. Whether you're a tourist or traveling on business, Backpacker 16 Accommodation is a great choice for accommodation when visiting Dubai. Backpacker 16 Hostel is good for big groups, solo adventurers, business travelers and couples. Our hostel has a manager on due who can be contacted 24/7. From here, you can enjoy easy visit most popular places in Dubai. Our hostel placed near Dubai Marina - one of the greatest area in the country. A lot of skyscrapers, big public beach, bay and yachts, plenty of restaurants, cafés and attractions - all of this only in 15 minutes from our hostel! Five minutes by walk to reach Dubai Internet City metro station (0.6 kilometers/ 0,37 miles). Also, our hostel is close to handmade Palm Island, Burj Khalifa (highest building in the world) and safari pick up location. 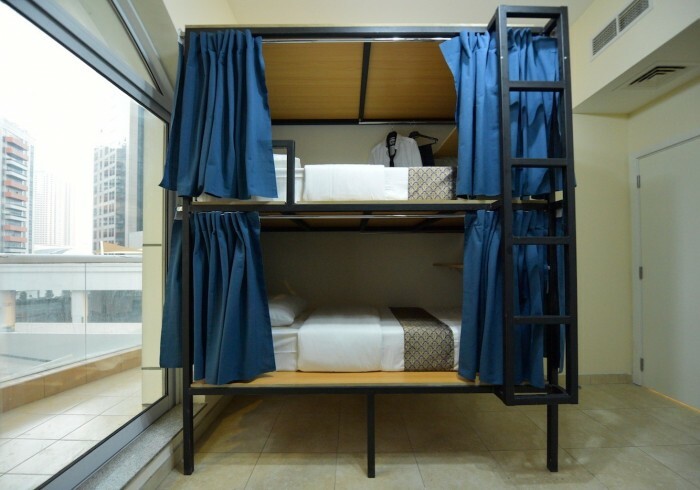 We offer a range of dormitories, from mixed to male and also female rooms of different sizes with shared bathroom facilities. You can spend time in swimming pool on the rooftop, GYM, sauna and steam room and common sitting room. In the hostel, you will have the kitchen, washing machine, locker, towel, hairdryer, iron, ironing board, microwave oven, toaster, extensions! Failure to arrive at the hostel will be treated as a No-Show and no refund will be given. Please note, that if you chose your estimated time arrival and you will not come within one hour, your reservation will be automatically canceled. Towel for hire at additional cost.